Newly=released surveillance video apparently shows Joran van der Sloot and Stephany Flores' first encounter. CBS News Correspondent Elaine Quijano said the video may bring to life some of the graphic details he confessed to Peruvian police. The case, police now claim, is rock-solid in their favor. Van der Sloot Called "Homicidal Maniac"
Quijano reported police in Peru will ask prosecutors today to formally charge van der Sloot with Flores' murder. Just hours before she was killed on May 30th, Flores is seen in the video walking in to a Lima casino. Van der sloot was already there. The surveillance video shows him playing poker. Flores walks up to his table and sits down. After he gestures, she moves to the seat next to his. Van der Sloot and Flores make some bets, play some hands and then Flores leaves. But she comes back and the two of them walk out together. That same night, again caught on surveillance video, they're seen going into van der Sloot's hotel room -- five years to the day Natalee Holloway disappeared. 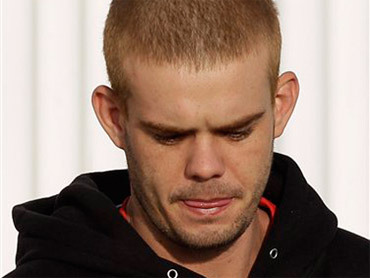 Four hours later, van der Sloot walks out alone. Flores' body was found two days later, her neck broken. Police questioned van der Sloot for days before he confessed, saying he killed her because she saw information about Holloway on his computer. Before he ever set foot on Peru, the FBI had been targeting van der Sloot in the Holloway case. In April, he allegedly offered a deal to Holloway's mother that he'd disclose the location of her daughter's body in exchange for $250,000. Private investigator Beau Dietl was hired by the Holloway family. Dietl told Quijano, "Van der Sloot is there and he admits to pushing Natalee down where she hits her head and she dies, that's what he states." The FBI then launched a sting operation. On May 10th, van der Sloot is given $25,000, but federal officials say he gave false information about the location of Holloway's body. Quijano said the FBI didn't move in because its case "wasn't sufficiently developed." Van der Sloot left Aruba and ended up in Peru -- a delay, Quijano said, that may have proved deadly to Flores. Quijano added the new video is the latest evidence police have in their case against van der Sloot. In fact, they believe their case to be so strong, they've decided against a crime scene reconstruction before formal charges are filed -- a move prosecutors are expected to make later today.